Great news for guests utilizing one of Disney’s dining plans- an assortment of meal options at Art of Animations’ Landscape of Flavor recently became eligible for purchase with a snack credit. For those who are trying to stretch their snack credits for a third meal each day and for those who are trying to get a little more “bang for their buck”, these new snack options area must! The majority of these are over $8 a piece, which is an excellent use of your snack credits. Of course, there is still a menu full of options to use as a quick service meal. And don’t forget dessert. 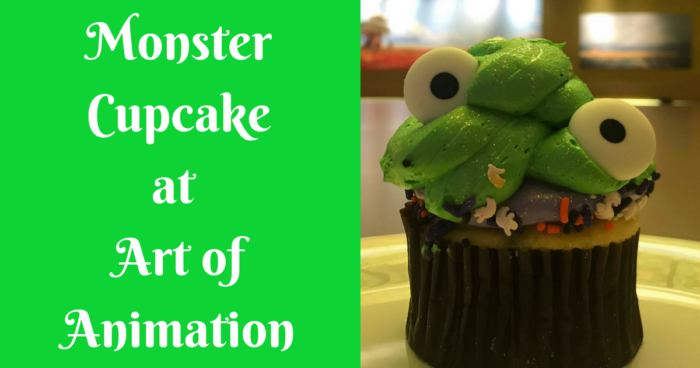 Right now you can also use a snack credit to try the Caramel Apple Monster Cupcake. Ready to plan your trip to Disney World? Looking for suggestions on how to best utilize a dining plan? Fill out the form below, or send an email for a FREE, no obligation quote with an Authorized Disney Vacation Planner. I offer rate monitoring to ensure you are receiving the best available rate offered by Disney. As an agent with MickeyTravels, I’ll be on hand to help you with everything from finding your perfect package to nabbing those hard-to-get dining and FastPass reservations. I work with all Disney Destinations including the Disney Cruise Line. Best of all, my services are absolutely FREE. Get in touch at 1.716.697.1211, via email at MickeyTravelsMeganN@gmail.com, or follow along on Facebook.